“I’m not ready yet.” He tightens his hold. “There’s nothing wrong with your daughter, Mrs. McIntosh. I said we’re not sleeping together. I didn’t say I didn’t want to." Some humans spend their whole lives making something that isn't real look like something that is. Reading Of Poseidon was a total blast. I've heard great things about this series from many trusted friends and bloggers, but even all the raves and recommendations didn't prepare me for the epic journey I was about to embark on. I laughed like a maniac, I swooned like a pre-pubescent teenage girl, and I read like my life depended on it. I couldn't get enough of the fantastic humor, fabulous chemistry between the characters, gorgeously imagined world and the deviously engaging, highly dramatic plot line. This is, hands down, my favorite mermaid book ever. From page one, I knew I was holding something very special in my hands. The scene at the beach - in which Emma meets (or rather slams into) Galen, and the hilarious exchange that follows, had me cracking up and beaming like I just won a million bucks. I loved Emma from the get-go, her quirky personality, unique looks, hysterical inner monologues and over-the-top awkwardness combined with fierceness and defiance. She's totally my kind of gal and I want her to be my best friend (as long as I don't end up like her last best friend, that is). And then the shark attack happened and I was completely and irreversibly hooked. I wasn't prepared for that at all. All the feels! I was shocked and dumbfounded, and in that moment - in that very first chapter - I already knew that this was going to be one of my favorite YA series. And I wasn't wrong. 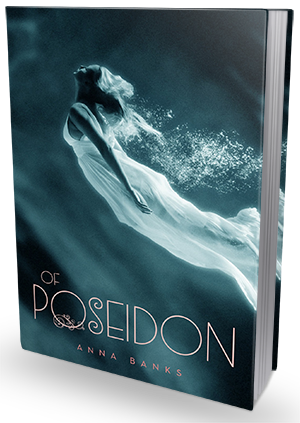 Anna Banks writing style reminds me a bit of Aimee Carter's The Goddess Test series, in that it's equally compelling, dramatic and evocative. These are both high-intensity series in my opinion, and I just love how fast-paced and emotionally affecting they are. Some plot developments were a bit predictable, but then again, there were things that shocked me and had me sitting with my jaw hanging down, so I'd say overall it was all very neatly balanced. There wasn't a single moment I would call slow or boring. In fact, I've breezed through the book in just one afternoon. I just couldn't put it down. The big plot twist at the end? I actually figured it out long before it happened, but still thought it was a brilliant and well planned development. As complicated as things were before, they were even more tangled and messed up at the end, and I just couldn't wait to dive into the next volume. It was a cliffhanger, yes, but one oddly satisfying and very promising. Mermaid books are not for everyone, but to be honest, I can hardly imagine anyone disliking this series. It's such a fun, entertaining, captivating, well written novel, I think I'd read it again just for the gasps, swoons and laughs. I highly recommend it! 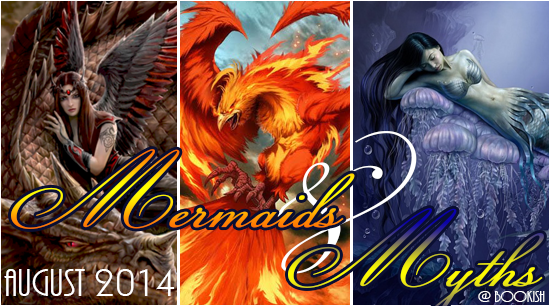 For more reviews, author features, discussion posts and giveaways, click on the banner to see the full MERMAIDS & MYTHS schedule!